As the deadline approaches, California’s uncertain water future remains just that, uncertain. The regulatory drought that faces the Central Valley has gotten the attention of the White House and made national headlines on radio programs and in newspapers, but not much has been done to solve the crisis. Many may dismiss the water crisis as decade old California water wars, but we must assure that all Californians know what’s at stake. Somewhere things got very off track when wildlife was elevated above human kind, families and communities. Some would call that a scare tactic, but scare tactics are exactly how we got where we are today. Whether global warming, DDT, or the use of plastic bags, scare tactics and fear have created record high unemployment numbers in Central Valley towns and thousands of acres of farmland to be followed all in the name of the environment. As a nation our priorities shifted, suddenly it became more important to save a species than to assure that crops have water and that we continue to produce safe, healthy food for our nation. California farmers and ranchers have gotten nothing more than political double talk and partisan politics as their futures are left to the whims of Mother Nature. In the 1950’s and 1960’s, California invested in infrastructure that today supplies farms with water. A water supply system that was revolutionary for its time and a system that would serve farms well into the future, but there is only so much water in the bucket. With population growth and water needed for the environment the amount of water dedicated to farms has gotten smaller and smaller. 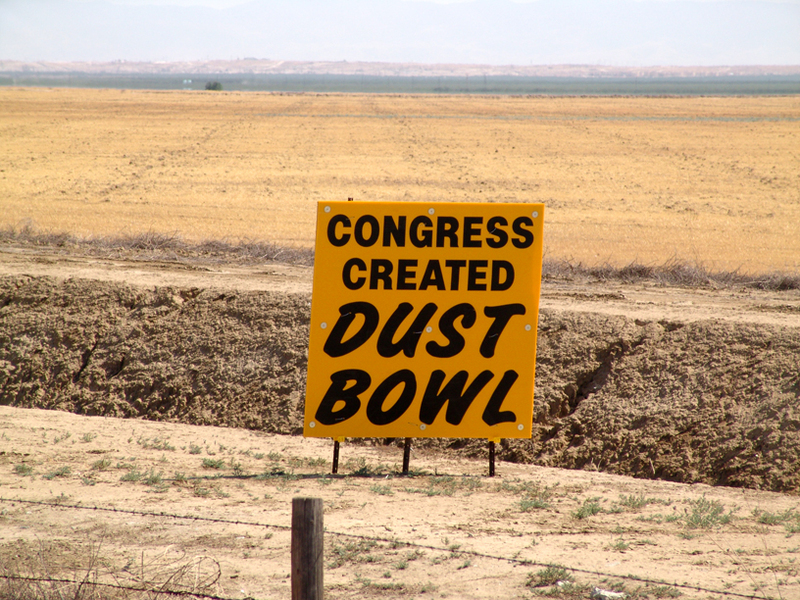 As innovative as Americans are we cannot “conserve” our way out of this water crisis. Simply conserving water is not going to help us when we do not have any more in our bucket. Farmers have given up water for fish and the environment time and time again, with little if any measurable success to show for it. So today, we ask for a real solution. As bailouts are given to Wall Street and Detroit car makers, and our federal government passes billions in stimulus spending to create jobs, all we need here in California to return hundreds of thousands of people to work is for water to flow to farms instead of out into the ocean. While that may mean changes in environmental laws, it is not an impossible task to accomplish. It is the third year of drought, and more water is going out into the San Francisco Bay than to the Central Valley. You can drive down I-5 and see the signs “Congress Created Dust Bowl” and “Water Equals Jobs”, but the most eye opening part of the drive is the hundreds of thousands of acres of farmland lying fallow. At a time when the bread basket of the world should be harvesting crops many fields lie empty.